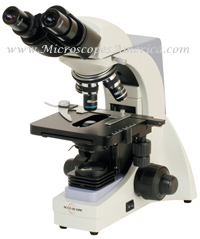 Visit www.MicroscopesAmerica.com for 3000LED, 3012, 3002 binocular microscopes at deep discounts with free shipping. Professionally selected Microscopes, excellent quality, deep discounts and Free shipping on ALL Orders! Select from Accu-Scope® , Ken-A-Vision and Premiere®. COLLEGES. LABORATORIES. RESEARCH FACILITY APPLICATION. The new Accu-Scope® 3000-LED Microscope Series was redesigned and engineered to exceed the exacting standard of life science professionals. The 3000-LED Microscope Series provides crisp, high contrast images with outstanding resolution, precision design, and enhanced illumination. Binocular Microscope with Infinity Plan Achromat Objectifs. • Viewing Head: Binocular, 30 degree inclined and rotatable 360 degree. • Eyepieces: HWF10x/20mm field of view; a pointer is standard in one eyepiece; eyepieces are locked-in to prevent classroom tampering. • Nosepiece: Reseved, quadruple, ball bearing with wide rubber grip for easy rotation. • Objectives: Infinity Plan 4x, 10x, 40xR*, 100Xr Oil* (*spring-loaded). • Condenser: N-A- 1.25 Abbe condenser with options for phase and darkfield sliders. • Stage: Mechanical stage, 140 x 132mm with X-Y movement range of 73 x 50mm. • Illumination: 3 watt LED with variable intensity control. • Focusing: Coaxial focusing system with an adjustable tension control and upper limit stop to prevent accidental damage to slides; all metal gears, brass fine focus gear. • Miscellaneous: Universal power supply for 11v-240v. • Dimensions (LWH): 275mm x 196mm x 383mm. • Accessories: Dust cover, immersion oil and instruction manual included. • Infinity plan 20x, 50Xr oil and 60xR objectives. • Dust cover, power cord, immersion oil and instuction manual. 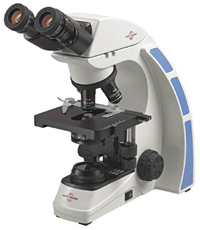 Click Here: The Accu-Scope® Model 3000 LED is also available in: 3001 LED Trinocular Microscope. Ergonomic Binocular Head, AIS Infinity Plan Objectives and Ceramis Mechanical Stage. Designed for research and other clinical applications, the 3025 features AIS infinity optical system renowned for resolution, contrast, and clarity that is among the very best in this class of microscope. 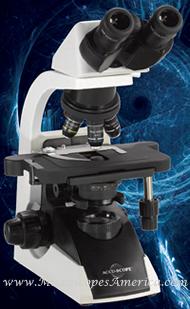 Sharp, high contrast images and a rigid cast alloy aluminum frame make the 3002 Microscope Series an excellent choice for educators, medical and veterinary professionals. Durable and ergonomic by design, the 3002 is built for many years of dependable use. Binocular Microscope with Achromat Objectivs - Halogen. • Dimensions: 231mm (L) x 178mm (W) x 360mm (H). Shipping weight 17 lbs. Shipping Dimensions: 15" x 11" x 19"
Binocular Microscope with Plan Achromat Objectives - Halogen. • Viewing Head: Bionocular head. Siedentopf type, inclination 30 degree, Interpupillary distance 47-75mm, 360 degree rotatable. • Eyepiece Tubes: Eyepoint height is adjustable and can be raised 35mm when the interpupillary distance is 64mm by rotating the eyepiece tubes up to 180 degree to accomadate the needs of various users. • Eyepieces: WF10x eyepiece, 22mm field of view with built- in diopter adjustment and reticle holder. Eyepiece accepts 26.5mm reticle. • Nosepiece: Quintuple, reversed type with positive click stops. •Stage: Rackless, scratch resistant rectangular stage, 188 x 150mm surface area with 78 x 54mm cross travel using low-positioned X-Y coaxial control knobs. • Condenser: N-A- 1.25 Abbe Condenser with aperture diaphragm and position guide markings for each objective and filter holder. • Focusing Mechanism: Coaxial coarse and fine focus mechanism. Fine focus sentivity 0.2mm. • Illumination: 12 volt 20 watt variable halogen, an optional field diaphragm is avaialble. • Stand: Cast alloy alumination with built-in carrying handle and removable lamp house for easy bulb replacement. Physical weight: 16lbs. • Miscellaneous: By using anti-mold paint and sealing anti-mold agents inside the microscope, the 3012 Series is designed for use even in hot and humid environments. • Microscope Dimensions (LWH): 10" X 9.25 X 16.75". Phisical Weight: 16 lbs. • Shipping Dimensions (LWH): 16" x 11" x 20". Shipping weight: 19 lbs. 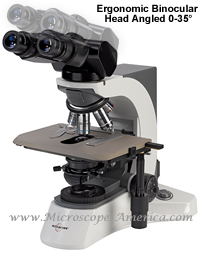 Click Here: The Accu-Scope® Model 3012 is also available in: 3013 Trinocular Microscope. Plan Achromat Objectives - LED. • Viewing Head: Binocular head. Siedentopf type, inclination 30 degree, Interpupillary distance 47-75mm, 360 degree rotatable. • Illumination: 3 watt variable LED (LED bulb has a rated life of 20,000 hour), an optional field diaphragm is avaialble. Binocular Microscope with Turret phase contrast - Halogen. • Stage: Rackless, scratch resistant rectangular stage, 188 x 150mm surface area with 78 x 54mm cross travel using low-positioned X-Y coaxial control knobs. • Objectives: AIS E Plan Phase 10x 40xR and 100xR, turret phase condenser with 10x40x and 100x phase annuli and BF position, centering telescope, green filter. Binocular Microscope with Turret phase contrast - LED.